This is a series of posts where we are reviewing the seven steps of The Success Habit Secret. 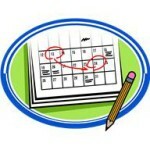 Step 4 is about identifying a specific schedule for the actions you will take to reach your goal. Step 4: Commit to a Specific Schedule for Taking Action. In Step 1 you described your goal in very specific detail, and in Step 2 you explored the strong positive feelings connected with your goal, Step 3 asked you to identify actions you will take to reach your goal. Now, let’s talk about when exactly you will take action. Knowing what you want and what you will do to get it won’t help much if you don’t ever make the time to take action. In my workshops I often talk about how our current obligations and commitments can get in the way when we start working towards a new goal. I like to use the expression, “life happens.” We make a Great plan and have all the best intentions of following through, but then “life happens” and we’re pulled off track. One of the best ways I know to stay on track is to schedule specific days and times for working on your new goal. You must identify when and how much time you will spend working towards your goal each week. Then add this to your calendar just like any other important appointment. This allows you to plan your activities for self improvement right along side the other things in your life that are important to you. • The commitment supports the consistency. • Others will know what is important to you and help out. • Consistency strengthens new patterns for the change you are creating. Share the tip: Do you know someone who is struggling with procrastination and could use some help creating a solid goal setting plan? Be Your Greatest Self today and forward this post to a friend. Share the inspiration and support of goal setting success. Or, paste your action-plan into this form for a FREE evaluation.